Get fit in 22-30 minutes/day! These 3 programs have helped challengers in my groups get amazing results time and time again! They are the complete package! Fitness + Nutrition + Support = Success! Women who follow the program generally lose up to 15 pounds! What changes can you make to your body and health in just 21 days? With the right fitness and nutrition you’d be amazed! Check out one of my challenger’s results! Michelle completed 2 rounds before boarding a cruise ship for her son’s wedding! Needless to say…she packed that bikini! 21 DAY FIX CHALLENGE PACK (w/Shakeology) Save $70! 21 DAY FIX KICKSTART CHALLENGE PACK (includes 3 Day Refresh) Save more than $90! Already finished 21 Day Fix? Or maybe you just want to challenge yourself a little bit more. Maybe you’re looking for a way to tighten up your nutrition and bump your workouts up a notch. This is a great program for 21 Day Fix graduates and anyone looking to really get focused, and do the work to get results! 21 Day Fix Extreme Challenge Pack (w/Shakeology) Save $70! 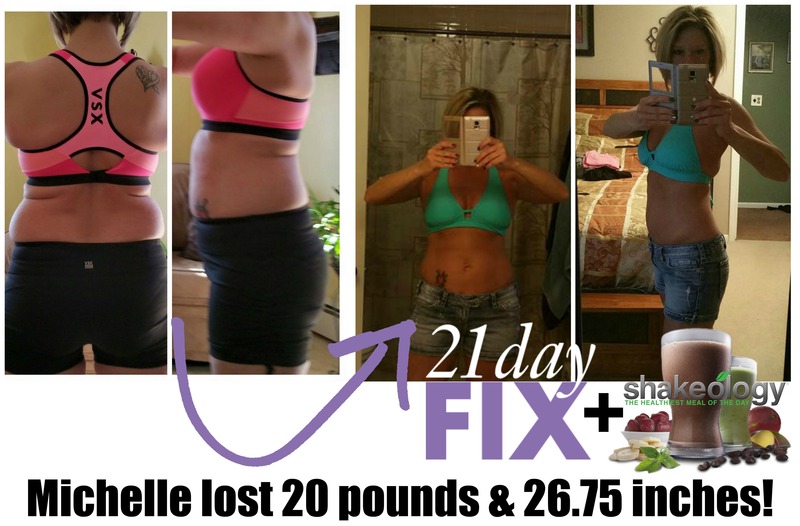 21 Day Fix Extreme Kicstart Challenge Pack (includes 3 Day Refresh) Save more than $90! Great for anyone who wants a straightforward and effective workout in a minimal amount of time. This Challenge Pack is perfect for people looking to pair exercise with nutrition to deliver results….like these! 22 Minute Hard Corps + Shakeology Challenge Pack Save over $105! *For a limited time, both packages come with a FREE sandbag and portion control containers! *All of the packages above will come with the complete program, plus a bonus workout, a 30 day supply of Shakeology, free access to Beachbody on Demand for 30 days, discount $2 shipping and access to my free support and accountability groups and 24/7 individual support. Pick a program that will work best for you and join my next support group for daily tips, recipes, meal planning ideas and motivation. I will be your free coach and help you get results! I will be there 24/7 to guide you and encourage you every step of the way! Previous PostPrevious Get Fit with Fix for Summer! Next PostNext Sneak Peek Tomorrow!